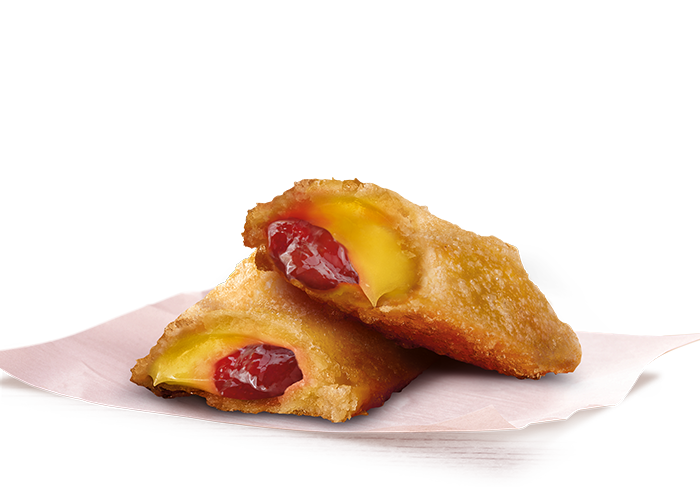 Crisp pastry, lovingly filled with a raspberry & custard filling for that extra sweet taste. Served piping hot. TWIN FILLED RASPBERRY CUSTARD PIE: Water, Wheat Flour, Sugar, Margarine (Vegetable Oils & Fats (Palm Oil, Soybean Oil), Water, Emulsifiers (471, 322 From Soy), Salt, Natural Butter Flavour, Preservative (202), Acidity Regulator (330), Natural Colour (160), Antioxidant (307)), Modified Starches (1412, 1442, 1422), Raspberries, Full Cream Milk Powder, Custard Mix (Thickeners (1442, 407), Dextrose), Whey Powder (From Milk), Iodised Salt, Dextrose, Raspberry Juice Concentrate, Natural Flavours (Contains Milk), Baking Powder (Raising Agents (450, 500), Wheat Starch, Mineral Salt (170), Vegetable Gum (466), Yellow Gardenia ExtractOIL VEGETABLE: Vegetable Oil, Food Acid (330), Antifoam (900).Twin Fill Pies are cooked in McDonald’s Vegetable Oil Blend.Contains gluten, milk, & soy. May contain TRACES of sulphites.